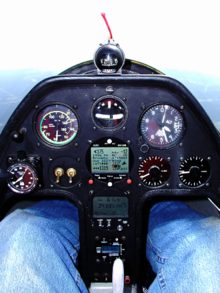 I recently wrote a post at Ask-a-CFI on a thread about stalling while turning. The post touched on the accuracy (or lack thereof) of the "ball" when it comes to indicating coordination. So I thought I should write a post here as well. The blog format allows me to expand on the inclinometer's strengths and weaknesses more than I could on a forum thread about a different topic. The inclinometer (AKA - the "ball") is used to indicate coordination of an aircraft. Coordination is a term we use to reference the slip angle. In coordinated flight, the slip angle should be zero. With any non-zero slip angle, we are in uncoordinated flight. The best way to measure and indicate coordination (or slip) is with a direct measurement of the airflow angle. Gliders use a yaw string to do exactly this. The string aligns with the relative airflow, so if the string is pointing straight back, the glider is coordinated. The rule here is "step on the space". In a powered aircraft (at least in single engine aircraft with the engine on the nose), a yaw string won't work because the airflow is disrupted by the propeller slipstream. Since this slipstream effect will vary with airspeed, power setting, angle of attack, and slip angle, there is no easy correction or compensation. So a yaw string is not a practical option in this case. As a result, the inclinometer (the ball) is used to provide coordination information. The problem is that the inclinometer doesn't actually measure slip angle. It measures lateral acceleration and compares it to bank angle (in other words, it compares centrifugal "force" to gravity). This balance between lateral acceleration and bank angle is then used as a proxy indication of coordination (slip). In a glider, this would actually work quite well—except that it would require a look inside the cockpit to confirm coordination, whereas the yaw string allows for continuous outside reference. In coordinated straight and level flight, the wings are level and there are no lateral accelerations. The ball is held in the low point of the glass tube by gravity. If we roll the aircraft but don't turn (requiring the use of opposite rudder), the low point moves, and gravity pulls the ball off-center. On the other hand, if we yaw the aircraft while keeping the wings level (requiring the use of opposite aileron), the air loads on the fuselage cause a lateral acceleration, and the ball gets pulled off center. If we roll the aircraft and allow it to turn, gravity and the lateral acceleration balance and keep the ball centered. Again, though, the ball is measuring lateral acceleration, not slip angle. So even in a perfect world, the ball becomes less sensitive at lower speeds—meaning that a given slip angle will be indicated by smaller and smaller ball deflections as speed is reduced (lower speeds mean less lateral drag force at a given slip angle). So at lower speeds, where slipping becomes more and more important from a safety standpoint, the ball gives us less information. But wait! It gets worse. The aircraft can be flying in a slip with no lateral accelerations (and therefore no ball indications). This is because yawing moments (for example from the engine) are balanced by a force applied at the rudder. This force doesn't just yaw the aircraft, but also pushes it laterally. This lateral push is cancelled by an equal and opposite lateral push due to the slip. Multi-engine pilots will be familiar with this, as it is an important consideration after an engine failure (it is, in fact, the reason why we "raise the dead"). In a single-engine aircraft at low speeds and high power settings, there is lots of yaw induced by the engine, so lots of rudder force is required. At the same time, the lateral drag caused by a slip is reduced by the low speed. So balancing these two (and thus centering the ball) can require a large slip angle. This is one (of several) of the reasons why an aircraft is more prone to spinning when it stalls power-on. All of the above notes refer to the ball during "slow" maneuvers—when the point we're rotating around is well outside the aircraft itself. But what about rapid yawing? In this case, the ball will tend to move away from the center of rotation. For example, in the Grob G-120A, we have 2 inclinometers installed—one for the student and one for the instructor. In a spin, they often indicate in opposite directions—left inclinometer goes left, and right inclinometer goes right. These conflicting indications occur regardless of the spin direction. This is why, in a spin, we don't use the ball to get oriented. Instead, we use the needle, which is a gyroscope and indicates yaw direction/rate with no reference to lateral accelerations. The bottom line here is that the ball is not very accurate at low speed, high power, and/or high yaw rate. But it still serves us well under most normal flight conditions. Understanding it's limitations can help us use it more effectively. It's been quite some time since I've posted here. I guess it's time to get back at it! SkyWriters Publishing is progressing well, and book sales are slowly taking off. The PPL Exam Prep book is especially popular. Recently, I was contacted by a student pilot who blogs about her experiences learning to fly. She has reviewed and posted her thoughts about the Exam Prep book HERE. So check out Vera's Blog, and then come back here and read a little about climbing for obstacle clearance. We're all taught in groundschool that in order to clear obstacles, we should climb at Vx, or the best angle of climb speed. With a little bit if theory, we also learn that Vx corresponds to the speed at which we get the most excess thrust (not to be confused with excess power, which provides us with climb rate). So far so good, all of this seems pretty straightforward. But in some aircraft types, the speed provided in the flight manual for an obstacle-clearance takeoff is at odds with the separately published Vx. For example, the flight manual for some models of the Cessna 172 call for a speed through 50 feet of 68 mph for obstacle clearance takeoffs, and list Vx as 75 mph. What gives? The key to understanding this discrepancy is in the distinction between equilibrium and non-equilibrium maneuvers (discussed here: http://www.flightwriter.com/2010/11/equilibrium.html). Vx is determined under the condition of equilibrium. During takeoff, we are not in equilibrium, we are accelerating—so some (or all) of the excess thrust being created by the engine is being used to change our airspeed instead of our height. Because of this, we need to make a choice: start climbing early (i.e. – before reaching Vx) and accept a shallower initial climb gradient, or accelerate just above the runway to Vx and climb at our best available angle. Which option is better? The prefered technique depends on the height of the obstacle. Consider the geometry of the two climb options. By climbing early, we will initially gain more height than climbing at Vx. But because of the reduced climb gradient, another aircraft climbing at Vx will eventually catch up and gain more height. Early in the climb, the aircraft climbing early and slow will be higher. Later in the climb, the aircraft climbing at Vx will be higher. At some height, which will be different for different aircraft (and may even be different for the same aircraft under different operating condition, such as weight and density altitude), the altitude of the two aircraft will be the same. For obstacles below this height, climbing early is preferable. For obstacles above this height, accelerating level and then climbing at Vx is preferable. How does this information affect operational decisions? Understanding the (generally) poorly explained flight manual data enables us to get more performance out of our aircraft with better safety margins. A perfect example would be taking off toward rising terrain with an elevation change of several hundred feet. In the above C-172 example, do we climb at 68 MPH or 75 MPH? An uncritical review of the performance tables would suggest 68 MPH. But we'll get better terrain clearance at Vx = 75 MPH because such a long climb gives us plenty of opportunity to establish equilibrium.